The list of newspapers with online paywalls is growing. 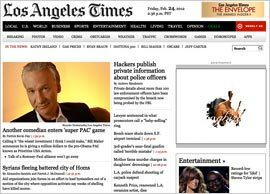 The latest addition is the Los Angeles Times, which announced plans to begin charging readers for online content starting March 5. Like other “metered” paywalls, visitors to the LAT Web site will be able to view a certain number of stories -- in this case 15 -- for free in a one-month period. Once the limit is reached, they will be asked to buy a digital subscription for $0.99 during a one-month introductory period. After that period is over, readers can choose between a combined print-digital subscription that gives them Web site access plus the print edition of the Sunday paper, for $1.99 a week, or digital-only access for $3.99 per month. As noted, a number of major newspaper publishers have begun to implement online paywalls over the last year, including some corporate siblings of the LAT. Earlier this month, the Chicago Tribune, also owned by the Tribune Co., revealed plans to begin charging for online content at some point. Another metro daily owned by the Tribune Co., The Baltimore Sun, began charging for online access in October of last year. In December the Chicago Sun-Times announced that it would begin charging readers for online content with a “metered” paywall. Visitors can view up to 20 articles per month for free, after which they are asked to pay $6.99 for a monthly online subscription, or $77.87 for an annual online subscription. And earlier this week, Gannett announced plans to create paywalls around online content for its 82 community newspapers; nine Gannett properties have already done so. These publishers are following the lead of The New York Times, which introduced a metered online paywall in March of last year. In October, The Boston Globe, also owned by NYTCO, unveiled a new system requiring readers to pay $3.99 per week for access. As with most (but not all) online pay walls, home delivery subscribers do not have to pay extra for Web content.